My friend Eloise is at it again! Nobody can make paper do what she can! 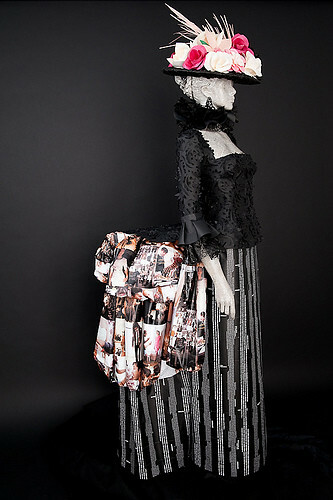 She recently teamed up with Ruffian to create this incredible paper dress now on display at the Museum of Arts and Design. Remember her life-size period costume dress inspired by Valezquez on display at Anthropologie a while back? Or how about her Macy’s window display of about a million paper flowers? Eloise is too incredible. This latest piece is mind-blowing. Btw, hope you all had a lovely weekend. I’m entering into my 39th week of pregnancy. EEK. Henry could come any day now or maybe he’ll wait till Halloween? Here’s what I look like, no that’s not a balloon in my shirt. I’m getting so tired of wearing the same clothing all the time, perhaps Eloise could make me a big paper dress? That’s amazing. I clicked on the photo and was awed by the detailing on the blouse. Stunning! Eloise is so incredible. She’s a tiny fireball of a girl blasting with creativity. If you even get the chance to see one of her paper dresses in person it will be well worth it. I can’t believe the amazing craftsmanship. Peruse her site too, she does illustration, dolls…..and more. She’s so great! I’m so happy to have met her. this dress is awesome. and i totally made a special trip to anthropologie to check out her last creation. who knew paper could be so freaking gorgeous?! It’s true she’s amazing. I met her a couple of years ago at Surtex and we connected. I’m in aw of her work. This is fabulous! Love it! So very unique and inspirational. glad you like it sarah….i guess eloise is getting lots of new fans!! Yay!